It should be a a big party for kids to be in Malaysia for holiday. And that can be true. For them it is a big party. From gently sloping swimming pools or a separate children's pool at the hotel, to the grand water paradises such as Sunway Lagoon (Kuala Lumpur) or the Lost World of Tambun (Ipoh). Sunway Lagoon is an international-standard theme park with a water-based section (wave pool, water slides, lazy river etc. ), land-based amusement park (thrill rides etc. ), an extreme park, scream park and wildlife park. These Parks are all well equipped with many water slides and wave pools. 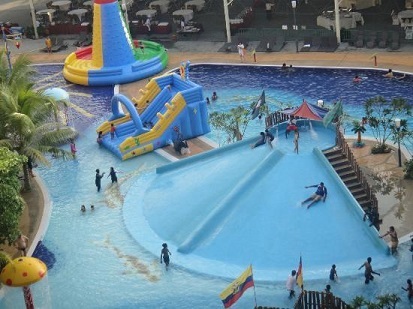 And don't think, these are the only water parks in Malaysia! You'll find them also in Bukit Merah or other places. There are also several them parks for the children. These theme parks is a mixture of adventure, water games and roller coasters. Tour operators offer "Packages" for the family or even to spend a night in such a park. 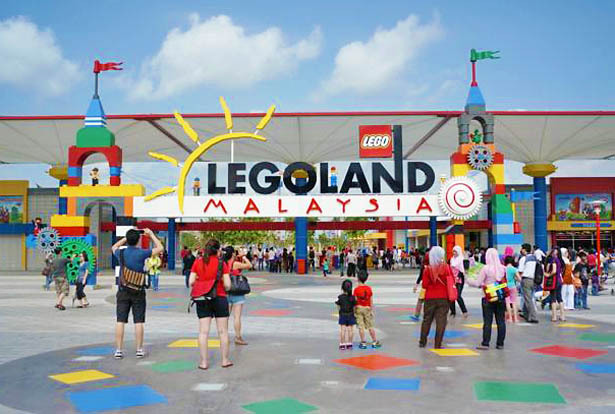 The latest theme parks are Lego land (in the south near Johor Bahru) and the Escape Theme Park on Penang. Well known are the amusement parks in the Genting Highlands, Cosmo's World (in Times Square shopping mall) and The Mines in Kuala Lumpur, but you also find them also in several bug city's. (have a look at the table above with the Theme Parks). People in Malaysia are very fond of children. Malaysians love kids and most Malaysian parents would not dream of going to a restaurant for example without their kids. In larger cities, but also in the smaller towns, you always find children playgrounds with equipment. Children love to play outside and friendship between children is easily made, regardless of the language they speak. "Best theme park in Johor (actually the only one of this size). I'm an annual pass holder, so I go pretty frequently. It's great for kids below 12... super awesome fun... brought my nephew (aged 4) there for the first time 2 years ago... refused to go home. That was the scene at the exit of Legoland... kids of primary school age bawling their eyes out coz no one wants to go home! Kids love it that much! If you're an adult looking to go without kids... please don't waste your time. There are about 5 jungle gyms there... your kids can spend all day there. The rides are pretty decent for the kids, most of them will love it. Now there's a water park too still a bit new... and lacking some rides but like I said this place has got potential to be much better. The Star Wars section is pretty small and basic when it was just opened, I understand that they've expanded it. Should be awesome being a Star Wars year this year? Food and drinks easily available, a little pricey but still ok, don't go buy food during lunch... que is mad. Weekends very packed, have to que very long for the popular rides, weekdays dont have to que for rides. The biggest negative thing is the HEAT! It's Malaysia!!!! They should've planted more trees etc. To be fair to Legoland, they heeded the public's complaint about the heat and put up several shades. But alas... still woefully inadequate. Hope they will continue to address the weather issues. Toilets are super clean and cool! sometimes I stay in the toilet longer as refuge from the heat! hahaha.....". Take a look at the travel brochure of your tour operator, and look how nice the swimming pool is for children. This is often an indication whether the hotel loves children. 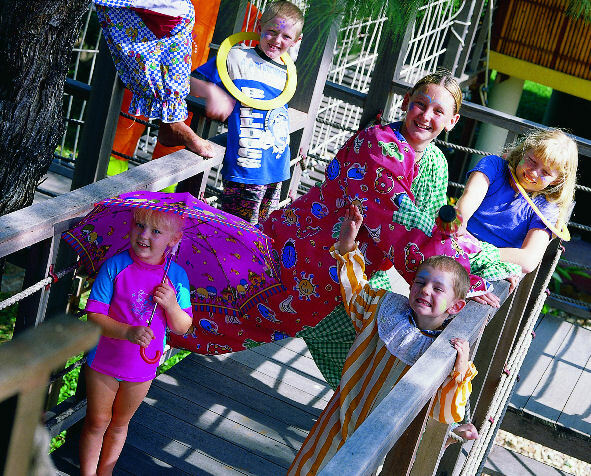 The hotels usually have a kids club, where your child can spend the day. 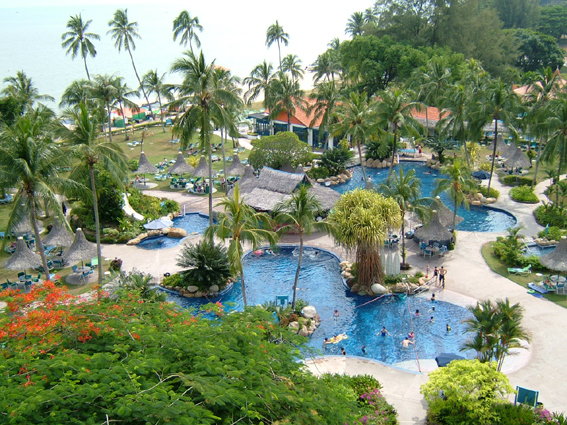 Examples are hotels like the Rasa Sayang and Golden Sands in Penang. There are activities inside but also inside. There's also joined swimming and games in the pool. That's a part of the program. If your child is having a birthday party, well, there's also a real cake. If you have lunch or dinner, you will notice that the staff will look after your staff. They will find a child from abroad very cute. Do not think "my child is fussy with the oriental food," because in addition to exquisite dishes you'll find a richly varied cuisine with, of course, chips and mayonnaise. In every shopping center there are restaurants of very famous American Fast Food Chains (McDonalds and KFC).